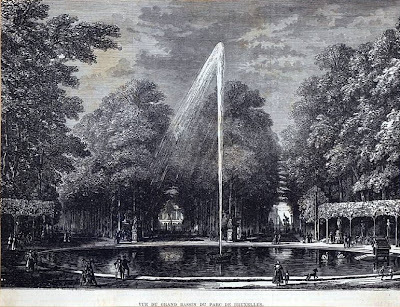 Eric Ruijssenaars has written this report on recent research done by him on Brontë connections in Brussels, with the help of other members of the Brussels group. 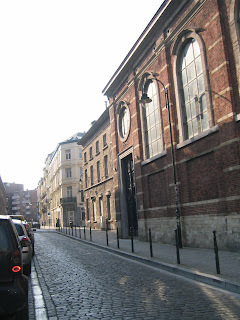 Despite having done research on the Brontës and Brussels for almost two decades now it was only two years ago that I started to concentrate on the burial places of Martha Taylor and Julia Wheelwright, the friends of Charlotte and Emily in Brussels in 1842, who died there that year. The girls were buried in the only Protestant cemetery in (Greater) Brussels, then in the suburb of St.-Josse-ten-Noode. Charlotte often walked to this cemetery in 1843. It features in The Professor, as the place where William Crimsworth and Frances Henri met again after their separation. Here also a number of British soldiers who died of their wounds after the battle of Waterloo lay buried. The Protestant cemetery was actually part of a larger cemetery. This cemetery was closed in 1877, at the same as a large new cemetery at Evere was opened. In 1885 it was visited by Theodore Wolfe, who wrote the following report. “Our way to the Protestant cemetery, a spot sadly familiar to Miss Brontë, and the usual termination of her walks, lay past the site of the Porte de Louvain and out to the hills a mile or so beyond the old city limits. From our path we saw more than one tree surrounded farmhouse which might have been the place of M. Paul’s breakfast with his school, and at least one old-fashioned manor-house with green-tufted and terraced lawns, which might have served Miss Brontë as the model for ‘La Terrasse’, the suburban home of the Bretons … From the cemetery are beautiful vistas of farther lines of hills, of intervening valleys, of farms and villas, and of the great city lying below. Miss Brontë has well described this place: ‘Here, on pages of stone, of marble, and of brass, are written names, dates, last tributes of pomp or love, in English, French, German and Latin‘. There are stone crosses all about, and great thickets of roses and yew trees, ’cypresses that stand straight and mute, and willows that hang low and still’; and there are ‘dim garlands of everlasting flowers’. Here ‘the Professor’ found his long sought sweetheart kneeling at a newly made grave, under these overhanging trees. And here we found the shrine of poor Charlotte Brontë’s many weary pilgrimages hither, the burial-place of her friend and schoolmate Martha Taylor, the Jessy York of Shirley, the spot where, under ‘green sod and a gray marble headstone, cold coffined, solitary, Jessy sleeps below’. 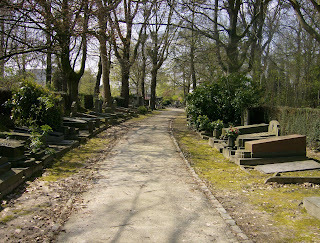 On 25 November 1887 The Times wrote: “British tombs in old cemetery of the Quartier Leopold (Rue du Noyer), Brussels - Notice having been given by the Municipality of Brussels that this cemetery is shortly to be cleared.” It went on to explain how relatives could ensure a ‘concession’ at the Evere cemetery. From the registers there we know the Taylor and Wheelwright families did not reply. In October a group of nine Brontë Brussels Group members visited this place. The ground of the former cemetery is now partly occupied by a fairly modern apartment building, with grass lawns on either side. The Protestant part of the cemetery lay close to the Rue du Noyer, we know from a detailed plan. Unfortunately the vistas Wolfe mentions have completely disappeared. We then went on to Evere, hoping of course to find the gravestones of Martha and Julia. The question is, can they be found? Two years ago I had an interview with Marcel Celis. As an archaeologist he has been digging in the remain of the old Isabella quarter, in the vicinity of the Place Royale. He is also the founding member of Epitaaf, which takes care of the funerary heritage of Brussels. He was able to tell me that the gravestones of the old cemetery can be found in lanes 14, 15 and 17 of the cemetery of Evere. So there we were, armed with brushes, as on a visit earlier in the year I had seen lots of graves covered by moss. It proved to be hard work. Occasionally there’s also a layer of earth on the stones. We did most of lane 15, without success. Unfortunately some inscriptions can no longer be read so we may never find the gravestones, but this field research will go on in 2009. In April there will be a new excursion. It seems certain that the bodies of the girls were put in a mass grave at Evere cemetery, since their relatives did not apply for a ‘concession’ there. It also seems certain that the gravestones were transported to Evere and therefore that they could possibly be found somewhere there. Since the October excursion I have been greatly assisted by Renate Hurtmanns, who paid several more visits to Evere cemetery, as you can see from her report below, with the latest on this research. 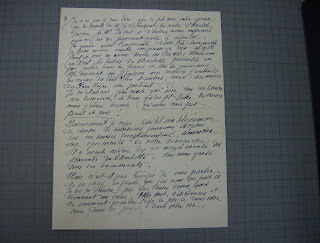 She has also helped me in transcribing letters written by Louise Heger, the daughter of Monsieur and Madame Heger. Some time ago I discovered that the Ghent Museum of Fine Arts has a large very interesting collection of letters written by her, including many she wrote to her parents, sisters and brother that give a valuable new insight into the family. There are also some reminiscences among the papers, among them the document below. It’s the only thing about Charlotte Brontë in these papers. On this page she describes how one morning in 1913 she heard men selling the newspaper Le Petit Blue shouting about the ‘love affair’ of Monsieur Heger. She and her brother Paul had just given the letters Charlotte wrote to Monsieur to the British Museum, after which they were published in The Times. In Ghent I made an exciting find, in a book about female Belgian 19th century artists: one of the paintings Charlotte describes in Villette (in the Salon chapter), La vie d’une femme. I hope to have it published, in colour, in Brontë Studies in 2009. Furthermore, we are able to give you a picture of the house where Monsieur Heger died. Last year I reported to you on this blog it had been demolished. Earlier this year Mr. Willaert, who had seen that article, sent us this picture. 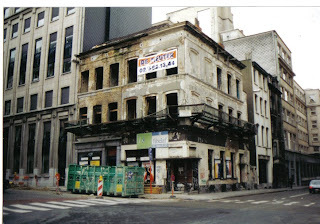 He explained that no buyer could be found for the house and that finally, after it had fallen into disrepair (as can be seen in the picture), the city of Brussels ordered its demolition because it had become a danger for passers-by. So this has been another fruitful year for the research on Brussels and the Brontës. And there’s still plenty to do in the coming years. The following reports were written by Sheila Richardson and Renate Hurtmann, who joined the cemetery excursion in October. Martha Taylor, a friend of Charlotte Brontë died in Brussels and was buried in the Protestant cemetery there. Charlotte writes in her letters home of walking to visit her grave sometimes on a Sunday. 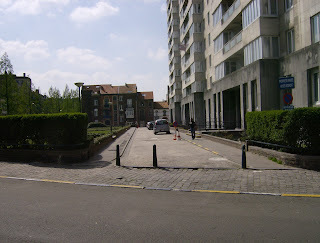 When the graveyard was due to be built over the graves were moved to the new Brussels cemetery at Evere. A small group from the Brussels Bronte Group visited Evere to look for Martha’s grave. This is a very pretty graveyard, like the original one described by Charlotte, with winding paths under a variety of trees and little open glades, bathed in the autumn sunlight on the day we went. As the graves were under the trees they were covered with moss, so we took brushes and cleared enough of each one to get an idea of who was buried there. Some were sad, the young children of English families buried far from home. One was for a soldier killed at Waterloo. The British Ambassador had placed a poppy wreathe there and there were slightly faded red roses in memory of some later soldiers. Unfortunately we did not find Martha’s grave. It might be that her parents were not aware that the graves were to be moved and therefore did not contribute to the cost. She may have been reburied in a common grave or an unmarked one. One of our group had researched the internet and found a statement in “The Haworth Village” site that said that both Mary and Martha Taylor were buried at Gomersal, the Taylor’s home village in Yorkshire. We were a little doubtful about the accuracy of this. Looking further on the internet I found that The Red House where the Taylors lived and described by Charlotte Bronte as Briamains in Shirley is now a museum. The secretary there, Helga Hughes, confirmed what we had suspected – that Martha remains buried in Brussels. The Haworth Village Site had not checked their information with her but she would now see that it was corrected. If you have come across the Haworth Site and been confused by this, I think it has now been clarified. The description of the Red House sounds delightful. It looks very much as it would have done in Charlotte’s day, from the elegant parlour including the stained glass windows described in Shirley to the stone flagged kitchen floor. Also the 19th century garden has been carefully recreated with old fashioned roses and some forgotten plants. The Barn has an exhibition of things that belonged to Charlotte and shows her connection with the area and the friends she developed there. Viewing details are on the site “Venue details - Red House Museum”. I returned to the Evere cemetery because Eric had informed me about the existence of loose old gravestones lying against the cemetery wall somewhere, among which could possibly be those of Martha Taylor and Julia Wheelwright. He also wanted me to go to lanes 14 and 17 and find out if there are also graves from English people who died before 1877 (the year of the closure of the Protestant cemetery). If not, this would strongly indicate that the old gravestones went only to lane 15 - where we had already started cleaning some of them on the occasion of our cemetery excursion. I did indeed find some graves in lane 14 as well as in lane 17 of English people who died before 1877, which means that they had been transferred from the Protestant cemetery to the one in Evere. Unfortunately - especially in lane 14 - there are lots of old gravestones in an awful state - completely sunken or covered by thick layers of earth, moss and ivy under which the inscriptions are often very difficult to decipher or have completely faded away after more than 150 years and there are also graves without any inscription at all. On the other hand, we know now at least for sure that we shall have to look for the old graves in the three lanes and not only in lane 15 ! Following the guardian’s description, I followed the long lane on the left when you enter the cemetery by the main gate, walking alongside the cemetery wall until I came to three little houses standing behind the cemetery wall. On the cemetery wall to the right-hand side of these cottages I found the tombstones in question, (46 in total) which I checked one by one. They are all but two legible, and even on the two on which the inscriptions have faded, I could decipher the word "begraven" (buried), which means that they come from Belgian graves, as all the others. There is not one single gravestone with an English inscription or name, which means that we can definitely give up the hope that Martha's and Julia's gravestones are among them! At the end of lane 14 I found 2 English graves with people having died before 1877 (so certainly people who were buried beforehand on the Protestant cemetery), i.e. Underneath was written “concession à perpétuité” – an inscription which I didn’t find on the other gravestones. Would that perhaps indicate that all the graves from the Protestant cemetery in St. Josse had been transferred to Evere (and not only those with a “concession”, i.e. burial places having been paid for, as the cemetery administration had told me on the occasion of a former inquiry)? There are other English graves, but the date of death was not legible! The old burial registers still available at the Evere cemetery administration – which I consulted from 1877 till 1890 – unfortunately this didn’t bring us one step further because they only consist of lists of people who died from 1877 onwards, i.e. from the time when the Evere cemetery was opened. There is no trace whatsoever of burial lists with regard to the persons whose graves had been transferred from the Protestant cemetery to Evere. However there might still be another possible source - the city archives of St. Josse - where I shall hopefully find out more at the beginning of 2009! 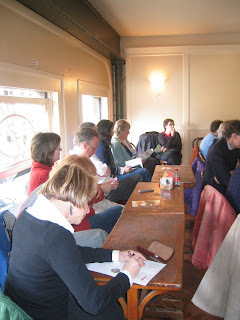 On Sunday 7 December 30 members of our group met for lunch at Restaurant L'Eperon d'Or. The Brontë group has eaten here before. The last time was during our Brontë weekend in April when the chef almost single-handedly prepared an impressive Victorian banquet for about 60 people devised by the Centre de Gastronomie Historique de Bruxelles. Our Christmas lunch was a simpler affair but as always in this restaurant, delicious and very good value for money. The service is friendly and there's something Victorian about the décor, appropriate for our group! It was a lovely way to round off the year and we'll be returning to this restaurant in 2009. 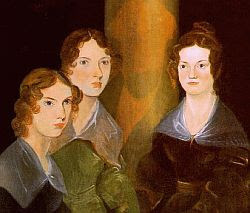 The Brontë Sisters' works are part of universal literature and everybody has heard about them at some time. A long time ago when I was younger I discovered at school the finest pieces of the Brontës and other English writers such as Dickens or Thackeray and I became interested in them. The first book I read of the Brontë Sisters was Wuthering Heights. I loved it immensely due to the accurate descriptions of the landscape and the passions related. This one was the only Brontë novel I read before arriving in Brussels five years ago. At that time I had found by chance an article about Emily and Charlotte Brontë's Brussels experience and how that influences their novels, even their lives in the case of Charlotte Brontë. The article I refer to ("A Foreign Affair" by Derek Blyth") was published in the Brussels English-speaking magazine “The Bulletin”. By reading that article I was really impressed by the fact that Emily and Charlotte lived in Brussels for a couple of years so as to learn French in a Belgian boarding school. As a result of her Brussels experience Charlotte wrote a magnificent novel titled “Villette”. I can assert that it stoked up the fires for my initiation to the Brontës' universe and motivated me to read “Villette” and to look for articles and other publications related to them. I was fascinated to learn about their tragic lives and how their personal experiences shaped these wonderful masterpieces of universal literature, despite the fact that they were women writers and at that time writing was only allowed to men. For instance I didn’t know that they were obliged to hide their names for fear that they would be criticised by Victorian society. I was amazed to find out that their pseudonyms Currer, Acton and Ellis Bell corresponded to their names' first letters. As I have said “Villette” was my initiation in finding out about the Brontës on my own until I got in touch with the Brussels Brontë Group. And how did it happen? Once again I have to refer to an article which I was handed. The article in question is about readers clubs in Brussels. I was impressed of the existence of a group which focuses on English 19th century literature, particularly the Brontës, and I made up my mind to write to them to get more information about their activities and the likelihood of partaking in them. I was accepted and I have written this small article for the group as a contribution and a commitment to involving myself in its activities. We aim to keep the Brontë heritage alive and spread it. On Saturday 18 October, exactly a year after organising its first talk, the Brussels Brontë Group once again brought the Brontës to a Brussels audience. 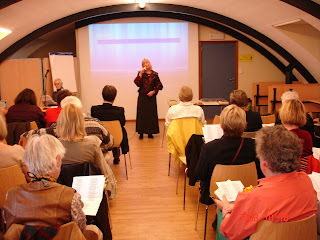 The talk hosted by us last year was on the theme of Charlotte's anguished letters to M. Heger. A journalist in a Brussels magazine announcing that event, getting a little carried away himself, invited people to "close their eyes and let themselves be swept along by this torrent of passion". 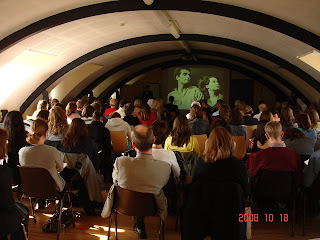 This year we again invited our audience to be swept along by a torrent of passion, but with their eyes open not closed, gazing at a screen on which they could watch Heathcliffs and Cathies from various film versions (the 1939 Olivier one, the 1970 one with Timothy Dalton and the 1991 version with Ralph Fiennes) chasing each other over the moors. 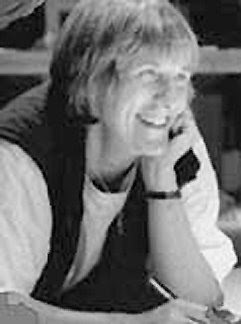 The film clips were shown to illustrate a talk by Patsy Stoneman called What everyone knows about Wuthering Heights: the novel and its film adaptations. She pointed out that many people are not quite sure whether they've read the novel or not, as it permeates our consciousness. Her comparison of scenes in the films with the corresponding passages in the novel revealed how often we, the readers, supply in our imaginations scenes (such as those between the lovers on the moors) not actually described in the novel. After the talk we wound up with some music before partaking of the refreshments offered by the university. 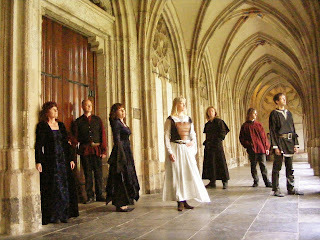 The music was supplied by a Dutch member of our group, Veronica Metz, who is the lead singer of Anois (www.anois.nl), a Celtic band which is recording an album of Emily Brontë's poems that she has set to music. With recorded accompaniment, she sang four songs to haunting melodies a little reminiscent of Enya's. Another member, Marina Saegerman, had prepared a display of her calligraphy versions of Emily's poems. I have just finished reading “Emily’s journal”, a book written by Sarah Fermi and published in 2006 and wanted to share my personal impressions. 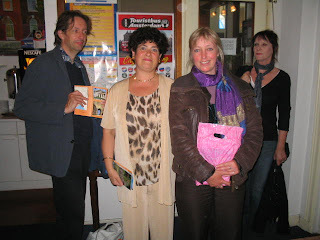 I met the author, Sarah Fermi, during the BS Southern Excursion in October 2007 and learnt about her theory that Emily must have had a relationship which in the end was the basis of her one great novel “Wuthering Heights”. I got fascinated by this theory and bought the book. Unfortunately, I only got to reading the book just recently. Reading this book really is an exciting experience: you start reading and the book does not let you go. You just have to continue reading until it is finished!! The starting point of the author, writing a journal as Emily could have done, stepping into Emily’s shoes, describing the events in Emily’s words, even if they are imaginary though based on factual data, with the comments of both her sisters, is really a remarkable but fascinating point of view. When reading the journal, you can really picture Emily sitting at her writing desk all alone in her room writing these words in her diary, keeping it away from the rest of her family. I was fascinated by the idea expressed by the author that Emily had “a boyfriend”. It is true, the passion elaborated in Wuthering Heights is very strong, difficult to believe it was all coming solely from the imagination of a young “innocent” woman. So the idea that she must have had a boyfriend at some stage in her life was most appealing to me. It also explained a lot. I have loved reading this book. Even though the author, based on her research, had to imagine how things might have been in Emily’s life (since so few real facts are known to us, Emily being a very private person), you can really believe this story and believe that these things actually happened. The author has really succeeded in convincing me of her theory. It made me look at Emily from quite a different perspective. It is a wonderful, extraordinary, fascinating, remarkable book, one that each Emily Brontë fan should have read! Perhaps they have, and perhaps I was the only one that had not read the book yet, but still! A book to be recommended! 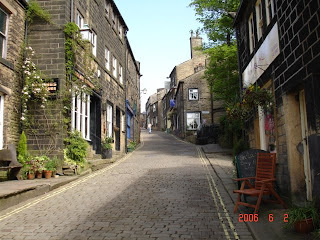 Following the success of our weekend of events in April 2007 timed to coincide with Charlotte Brontë's birthday on 21 April, for which we were joined by our members from the Netherlands and also by members from the UK, this April we are organising another Brontë weekend. This year's programme is much more ambitious since it will include a Brontë conference being organised by the Brussels public library Bibliothèque des Riches Claires with our assistance. This conference is an initiative of the chief librarian, who had the idea of organising an event to honour the Brontës' stay in Brussels after reading our member Eric Ruijssenaars' books on this subject and agreed to hold the conference during our Brontë weekend. Robert Barnard, former Chairman of the Brontë Society, author of A Brontë Encyclopedia and writer of crime fiction, who will give an introductory talk, will be in Waterstone's with fellow writers and Brontë enthusiasts Eric Ruijssenaars (Charlotte Brontë's Promised Land: the Pensionnat Heger and other Brontë places in Brussels), Derek Blyth (Brussels for Pleasure and other guide books) and Maureen Peeck O'Toole (Aspects of lyric in the poetry of Emily Brontë) to talk about their books and answer your questions about the Brontës. There is no charge for this event and no need to reserve - just turn up on the day. Roel Jacobs: Bruxelles au 19ème siècle, ville dynamique? Robert Barnard: The world the Brontës grew up in (class and social change in early 19th century England). Eric Ruijssenaars: Down the Belliard steps (and what Charlotte found there). Georges Mayer: Les soeurs Brontë: quartier Isabelle, vie universitaire et artistique à Bruxelles. Paul Héger: Ascendance et descendance de Constantin Héger. 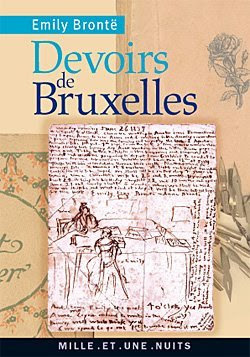 10-29 April: Exhibition in Bibliothèque des Riches Claires showing Brussels in the period of the Brontës' stay. Open 13.00 to 17.30 Monday-Friday and 10.00 to 12.00 on Saturdays (except Saturday 19 April). 19.00: 19th century English meal provided by the Centre de Gastronomie Historique de Bruxelles. 10.00: Guided walk around Brontë places in Brussels. All events are open to non-members.